Another new era for Irish football, this one flying under the radar of Mick McCarthy's second coming, but arguably more vital to the future of the international game here. 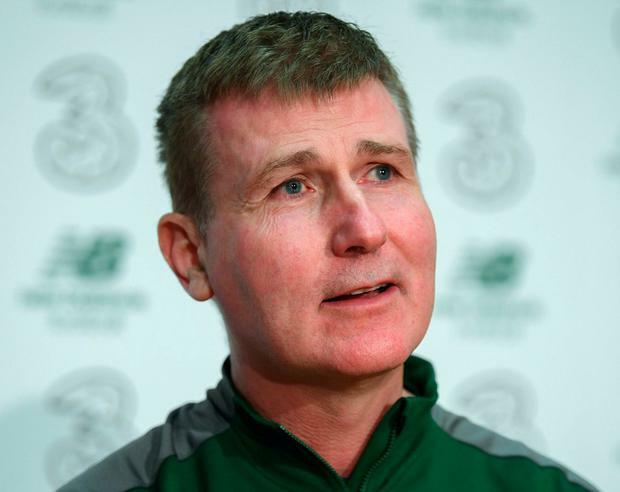 Stephen Kenny takes the helm of the U-21s for the first time in Tallaght Stadium tomorrow with the twin task of advancing not just his apprenticeship for his impending personal promotion, but also the need to accelerate the pathway of emerging players. That he does so on familiar Tallaght turf, close to home and the fields where he first announced his bright talent, is a poignant symbol of his new-found status and one that will hopefully attract local support. "We are looking forward to having a good crowd," said Kenny. "There is a lot of interest and anticipation. "We'd like to promote players to the U-21s younger, so they step up and experience playing for Ireland at that level and show that they have the potential over a period of time to become senior internationals." He has been dealt a cruel enough hand, ceding a glut of striking options, chiefly Michael Obafemi and Troy Parrott, a circumstance which, for now, mirrors the case in the senior team. Nonetheless, he remains unbowed and imbued with a confidence, apparently shared by his players, that he will remain committed to the fluid, expansive game that marked his tenure as Dundalk boss as he mixes and matches players from a variety of leagues, home and abroad, as well as age grades. "How he wants to play is drilled into us already after a few analysis sessions and training," said Brighton midfielder Jayson Molumby, who hails from Cappoquin in Waterford. "The boys have taken to how he wants us to play. He's given us freedom, a lot of managers are very structured, very intense in what they want and need or want. "He's just said he wants us to go at teams. I think Ireland don't do that enough. We don't run people into the ground like we used to, work like dogs on the pitch." Luxembourg should be a push-over but they retain the majority of players who pushed France, for one, close in the last European qualifying campaign. "It won't be easy this week," Kenny warned. "When I looked at the draw and didn't know anything about it, I said that would be the game we'd want first, Luxembourg at home, because you are formulating a team and learning about players. "Because the campaign is every two years, they have 15 players who were involved last time, we've only got one. "Five or six of their team played in the last campaign against France, where they were 2-0 up against a team with Moussa Dembele and Olivier Ntcham but lost 3-2. "In France it was 1-0 until the final minute when France scored again. They obviously beat Bulgaria 1-0. "They've decided to throw all their young players in earlier, with a view to a project, so they have got a decent team looking at them. "Some of their players are playing in the Bundesliga U-23s and U-19s leagues. We'll have to earn the win, but that is certainly our intention - to earn it."